A voting machine in Reynold's Club, where students cast their votes for the midterm elections. The University of Chicago currently leads the country as the university with the highest percentage of undergraduates registered to vote on TurboVote by a substantial margin. UChicago is ahead of its closest competitor, Harvard University, by more than 30 percentage points. As of October 31, UChicago had 71 percent of undergraduates registered, while Harvard University had 38 percent. Both universities have a large institute of politics that has launched efforts to increase voter turnout for next Tuesday’s midterm elections. Universities ranked by percentage of undergraduates signed up to vote via TurboVote. Photo provided by Dylan Wells. Data from TurboVote. 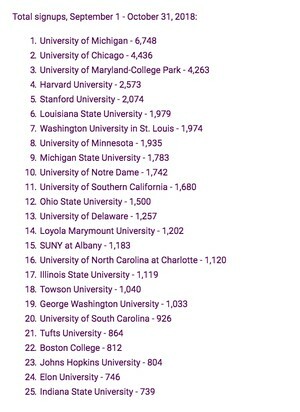 Universities ranked by total number of students signed up to vote via TurboVote. 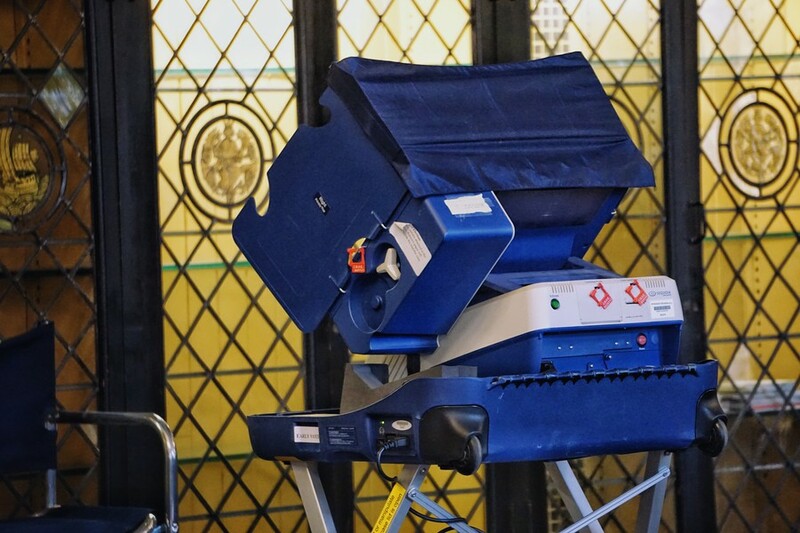 UChicago’s considerable lead in voter registration comes as its Institute of Politics (IOP) holds an early voting location on campus for the first time. Student-led on-campus voting advocacy group UChi Votes planned and executed this effort with the support of the IOP and the University of Chicago Democracy Initiative. UChi Votes has not yet disclosed how many students have voted early so far, but students say that having early voting on campus has made voting much easier. The IOP founded UChi Votes this school year with the aim of increasing voter registration to 70 percent of eligible voters in the University and increase voter turnout to 40 percent. Fourth-year College student Andrew Mamo, lead coordinator of UChi Votes, said that the strength of UChi Votes comes from students leading the initiative. In the beginning of the school year, UChi Votes trained 80 students to be “voting ambassadors” throughout campus. Mamo said this ambassador program was a key area of success. “Anyone from first-years to upper-level graduate students said, ‘I want to learn the do’s and don’ts of registration and turnout efforts and then go back to my community and make sure that everyone is registered and voting,’” he said. On top of the early voting location at Reynolds, UChi Votes gave out food and held performances on Bartlett Quad. José Morin, a second-year who performed with his dance group Groove Theory, said this election holds particular importance for him. The majority-Republican Congress is hoping to maintain its stronghold this election season, while a Democratic minority will try to net the 23 seats needed to overtake the House of Representatives and the two seats needed to control the Senate. This mindset echoes that of the country at large. According to USA Today, most states have seen an increase in voters registered when compared to the past election, a statistical oddity during a midterm election year. Mamo said that UChi Votes hopes to build on the political momentum of the midterms leading up to the Chicago municipal elections in February, when Chicagoans will elect a new mayor and aldermen. In the future, Mamo hopes to see UChi Votes and the IOP supporting RSOs in their efforts to promote civic engagement. UChi Votes will continue to hold early voting on Friday from 10 a.m. to 5 p.m. Voters registered in Chicago can vote early at any early voting location until Monday, November 5. Next Tuesday, Illinois voters can register to vote and cast their vote at the registered precinct of their permanent residence. New group UChi Votes seeks to increase campus voter registration to 70 percent, up from 58 percent in the 2014 midterms.